Product review: Flight Training Experience – by R Perkins, 7 Aug 17 5/5 Excellent "Extremely easy to arrange date. Call answered promptly and date requested was available. No need to rearrange. Found the venue easily and the facilities were fantastic - clean toilets; great onsite restaurant with good selection of meals. (Did forget one of our orders but quickly sorted out). Viewing area for family/friends. The staff were very friendly and my flight instructor 'Richard' was extremely knowledgeable. I felt well informed and in very safe hands - he made my first flight experience one to remember and I can't wait to take to the skies again soon. (Briefing) Excellent. Everything was covered and explained thoroughly. All questions were answered.(Experience)Amazing! Having wanted to do this for many years it was more than I expected and the whole experience was exhilarating. I have already recommended it to family and friends. We were given plenty of time for photos and to take it all in. My family said I didn't stop smiling from start to finish (and for hours afterwards!) I can only describe the whole event as Wonderful, excellent, amazing!The voucher was purchased as a gift to me but I have been informed that Experiences4all did a great job! " The experience will allow you to sit back and relax while viewing the countryside from above and take control while friends and family watch from the ground. Family and friends are welcome to follow you out to the aircraft to take photos. Food and drink (Purchased Seperately) is available from our fully licenced bar. A carvery is available on Sunday's, booking in advance is advisable, see your voucher for contact details. Maximum Weight: 15 Stone. Maximum Height: 6" 9'. Please See Our 4 Seat Flights For Less Restrictions. Extremely easy to arrange date. Call answered promptly and date requested was available. No need to rearrange. Found the venue easily and the facilities were fantastic - clean toilets; great onsite restaurant with good selection of meals. (Did forget one of our orders but quickly sorted out). Viewing area for family/friends. 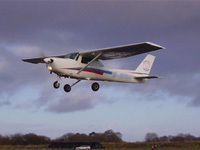 The staff were very friendly and my flight instructor 'Richard' was extremely knowledgeable. I felt well informed and in very safe hands - he made my first flight experience one to remember and I can't wait to take to the skies again soon. (Briefing) Excellent. Everything was covered and explained thoroughly. All questions were answered.(Experience)Amazing! Having wanted to do this for many years it was more than I expected and the whole experience was exhilarating. I have already recommended it to family and friends. We were given plenty of time for photos and to take it all in. My family said I didn't stop smiling from start to finish (and for hours afterwards!) I can only describe the whole event as Wonderful, excellent, amazing!The voucher was purchased as a gift to me but I have been informed that Experiences4all did a great job! Mrs Janet Wilcox (mother) booked the surprise flight. [Arranging date] very easy.Very easy [to get there] the SATNAV took us straight there. [Staff and Equipment] all excellent. Very easy to arrange, very helpful telephone operator. I had to changed the date I booked but it was no problem at all. Very easy to find and a nice drive in the Devon countryside to get there. A good cafe/restaurant on site as well. The staff were friendly and helpful. The equipment was well maintained, clean and modern. Just the right amount of input for a first lesson, informative but not over done. I really enjoyed the experience, and would recommend it to anyone. We had the chance to take photos but we didn't. My wife booked this experience for me, she said she had no problems and all seemed as agreed.